Historically, the rivers of the Central Valley had seasonally variable stream flows and diverse habitats. Rivers tended to flood in winter, with low flows in summer. Salmon used in-channel gravel beds for spawning, deep in-channel pools for holding, and off-channel floodplains and tidal marshes for rearing. One hundred fifty years of agricultural land use, urban development, and water diversion have simplified habitats and altered stream flows, radically changing the quality, extent and spatial patterns of fish habitat and making today’s rivers very different from those in which California’s native fishes evolved (Moyle 2002, Brown and Bauer 2009, Hanak et al. 2011). As a result, Central Valley Chinook salmon stocks have gone from a diverse collection of wild populations occupying the diverse habitats of the historic Central Valley to a portfolio dominated by fall-run Chinook produced in four large hatcheries (Lindley et al. 2009). Habitat degradation paired with deleterious effects of hatcheries have put the Central Valley Chinook salmon on a clear trajectory towards extinction (Katz et al. 2012). While there is no going back to historical conditions, the amazing adaptability of Chinook salmon, if freed from hatchery interference, should allow them to adapt to the modern environment if restoration actions give them a chance (see previous blog). 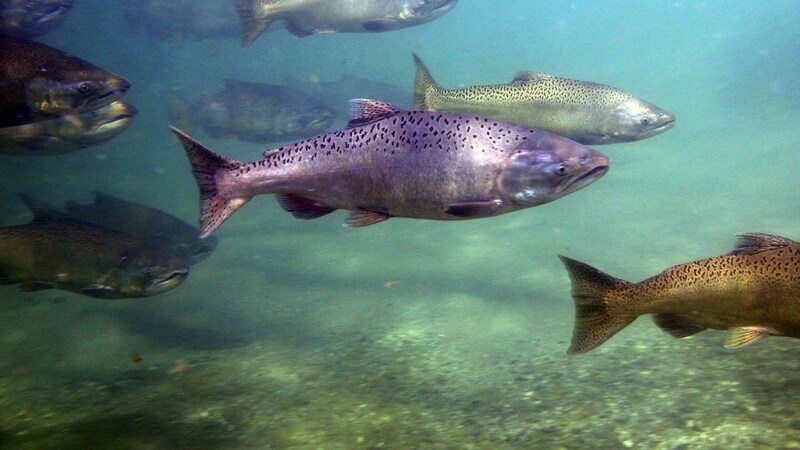 Actions to protect Central Valley salmon have primarily focused on hatchery production or specific defensive actions intended to prevent further declines. Thus, as legal and political opportunities presented themselves, more water was released from dams, large diversions were screened to reduce intake of young salmon into canals, some barriers to fish passage were removed, and juvenile salmon sucked into the large South Delta pumping plants were captured and trucked back to the Delta. A slight increase in Chinook numbers from 1994 to 2005 was attributed in part to these actions, although more favorable water years and good ocean conditions were probably more important overall, as the subsequent collapse in 2006-2009 indicated (Lindley et al. 2009). Additional band-aids continue to be proposed, such as trapping adult salmon and trucking them above impassable dams to spawn in rivers now flowing into reservoirs. However, a truly integrated management strategy that balances wild salmon conservation with hatchery production for fisheries does not currently exist. Instead, hatcheries below the big dams continue to be the principal means of producing salmon returns (Williams 2006, Barnett-Johnson et al. 2007, Johnson et al. 2012) even as the evidence increasingly shows these practices to be counterproductive (Araki et al. 2007, Kostow 2009, Chilcote et al. 2011, Christie et al. 2012). 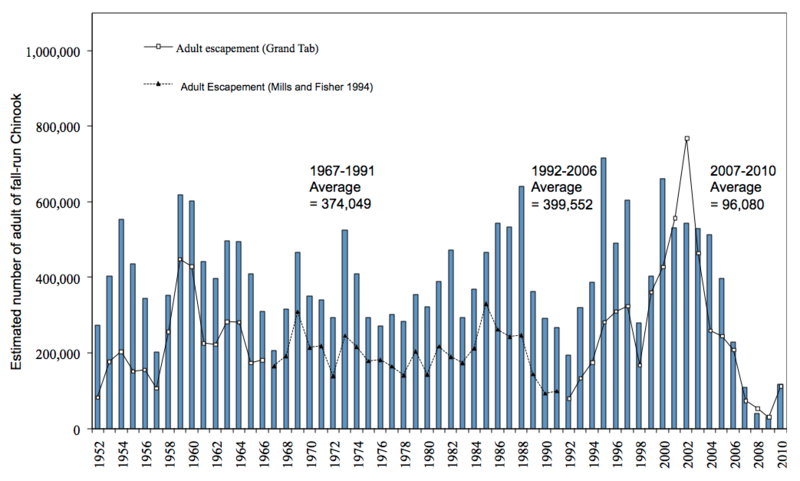 Estimated return to rivers (escapement) and total production (escapement + catch in fisheries) of Central Valley fall-run Chinook salmon 1952-2010. Source data: AFRP Chinookprod, accessed Jan 25, 2012. In the Central Valley, where more than 70% of salmon spawning habitat has been lost, recovery actions have focused on improvements to remaining in-stream spawning and rearing habitats with little focus on off-channel habitats despite the loss of more than 90% of floodplain rearing habitat. Recent scientific investigations have illustrated the importance of floodplain and estuarine habitats for rearing salmon (Sommer et al. 2001, Jeffres et al. 2008) as well as the dramatic negative effects on native fishes of altering stream flows (Marchetti and Moyle 2001, Kiernan et al. in press). This new understanding suggests that current restoration actions will never lead to recovery. If recovery of self-sustaining, naturally-spawning populations of salmon and other native fishes is truly the objective then a comprehensive re-design and reoperation of Central Valley water infrastructure is necessary. We need to simultaneously address the range of factors affecting salmon for each of their life stages in an integrated portfolio of actions, such as those listed below. Manage dams and in-Delta diversions to promote flow regimes that favor native organisms. Manage Central Valley rivers as an integrated unit while prescribing specific flows in specific rivers for specific objectives. This would include actions such as managing flows for different species (or fish communities) in different locations to make best use of water allocations. Target large-scale re-connection of floodplains to their river channels which will both reduce flood risk for urban communities and, if properly designed, substantially improve ecosystem function for fish, waterfowl, and other wildlife (such as Yolo, Sutter, Colusa and Chowchilla bypasses and setback levees where appropriate). Restore natural migratory access to as much of the Sacramento-San Joaquin system as possible by removing dams (such as Englebright Dam), improving flows (such as the San Joaquin River), or providing/improving passage over barriers. Expand tidal marsh habitat in the San Francisco Estuary and Delta, through strategic levee breaches and similar actions. Such actions will do much to aid recovery of naturally-produced, self-sustaining populations of fall-run Chinook. However, it must be realized that habitat-based and flow-based actions alone will never result in recovery of natural populations of Central Valley Chinook salmon, as long as hatchery practices continue to limit the reproductive and adaptive potential of naturally- produced fish (see previous blog). The present system is broken in many ways, perhaps irrevocably. Restoring salmon will require more than incremental solutions. Improved flows, habitat restoration, or hatcheries alone will always be inadequate. Under the status quo, extinction of all four Central Valley Chinook runs is increasingly likely, particularly as changes in climate and continued development compound existing stresses (Katz et al. 2012). Maintaining salmon populations, even at present levels, will require new thinking, fundamental changes to management, and an integrated portfolio of recovery actions specifically designed for future conditions and the biology of the different populations. J. Katz & P. B. Moyle. Have our salmon and eat them too: Re-thinking salmon hatcheries in the Central Valley. California Water Blog. February 29, 2012. Jeffres, C. A. Frolicking fat floodplain fish feeding furiously. California Water Blog. June 29, 2011. Moyle, P. B. Coho in Crisis, Part 1: The decline toward extinction in California. California Water Blog. October 12, 2011. Araki, H., B. Cooper, and M. S. Blouin. 2007. Genetic effects of captive breeding cause a rapid, cumulative fitness decline in the wild. Science 318:100-103. Barnett-Johnson, R., C. B. Grimes, C. F. Royer, and C. J. Donohoe. 2007. Identifying the contribution of wild and hatchery Chinook salmon (Oncorhynchus tshawytscha) to the ocean fishery using otolith microstructure as natural tags. Canadian Journal of Fisheries and Aquatic Sciences 64:1683-1692. Brown, L. R. and M. L. Bauer. 2010. Effects of hydrologic infrastructure on flow regimes of California’s Central Valley rivers: Implications for fish populations. River Research and Applications 26:751-765. Chilcote, M. W., K. W. Goodson, and M. R. Falcy. 2011. Reduced recruitment performance in natural populations of anadromous salmonids associated with hatchery-reared fish. Canadian Journal of Fisheries and Aquatic Sciences 68:511-522. Christie, M. R., M. L. Marine, R. A. French, and M. S. Blouin. 2012. Genetic adaptation to captivity can occur in a single generation. Proceedings of the National Academy of Sciences 109:238-242..
Hanak, E., J. Lund, A. Dinar, B. Gray, R. Howitt, J. Mount, P. Moyle, and B. Thompson. Managing California’s water: from conflict to reconciliation. Public Policy Institute of California. San Francisco, California. Jeffres, C. A., J. J. Opperman, and P. B. Moyle. 2008. Ephemeral floodplain habitats provide best growth conditions for juvenile Chinook salmon in a California river. Environmental Biology of Fishes 83:449-458. Johnson, R. C., P. K. Weber, J. D. Wikert, M. L. Workman, R. B. MacFarlane, M. J. Grove, and A. K. Schmitt. 2012. Managed metapopulations: Do salmon hatchery sources lead to in-river sinks in Conservation? PloS ONE 7:e28880. Katz, J, P. B. Moyle, R. M. Quiñones, J. Israel, and S. Purdy. 2012. Impending extinction of salmon, steelhead, and trout (Salmonidae) in California. Environmental Biology of Fishes. DOI 10.1007/s10641-012-9974-8. Kiernan, J. D., P. B. Moyle, P. K. Crain. In press. Restoring native fish assemblages to a regulated california stream using the natural flow regime concept. Ecological Applications. Lindley, S. T., C. B. Grimes, M. S. Mohr, W. T. Peterson, J. E. Stein, J. J. Anderson, L. W. Botsford, D. L. Bottom, C. A. Busack, and T. K. Collier. 2009. What caused the Sacramento River fall Chinook stock collapse? US Dept. of Commerce, National Oceanic and Atmospheric Administration, National Marine Fisheries Service, Southwest Fisheries Science Center, Fisheries Ecology Division. Marchetti, M. P. and P. B. Moyle. 2001. Effects of flow regime on fish assemblages in a regulated California stream. Ecological Applications 11:530-539. Sommer, T. R., M. L. Nobriga, W. C. Harrell, W. Batham, and W. J. Kimmerer. 2001. Floodplain rearing of juvenile Chinook salmon: evidence of enhanced growth and survival. Canadian Journal of Fisheries and Aquatic Sciences 58:325-333. Williams, J. G. 2006. Central Valley Salmon: A perspective on Chinook and Steelhead in the Central Valley of California. San Francisco Estuary and Watershed Science 4. This entry was posted in Biology, Conservation, Dam Removal, Fish, Restoration, Sacramento-San Joaquin Delta, Sustainability and tagged adaptive management, California, Central Valley, Chinook salmon, fish biology, fish migration, Moyle, restoration, salmon, UC Davis Center for Watershed Sciences. Bookmark the permalink.